I just love My Masterpiece classes. I have so much fun teaching them and all that participate have so much fun too. Everyone's painting is unique and beautiful! I hope you'll consider coming to our next class. 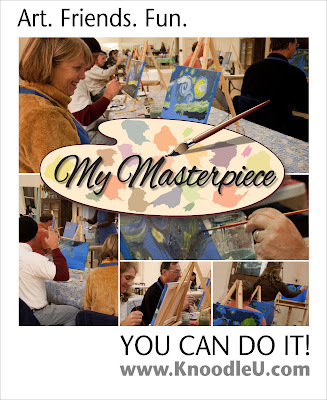 Lots of laughs, step-by-step instruction, and a masterpiece that is all your own! A wind swept starry night will inspire you. An intense focus of a poppy will leave you breathless. The reflections on the water lilies will set your mind a blaze. When was the last time you gave yourself the opportunity to be creative? If you're like most of us, it has been a long time. Spending time with the masters of art will increase your awareness of the life around you, help you to appreciate it, and feel refreshed about it. And if that wasn't enough, the FUN FACTOR is always beneficial.